Don’t miss these sightseeing hotspots! Looking for somewhere to watch the match while you’re in the city? Here are some hidden treasures that only the locals know about. Yekaterinburg has a fascinating history and plenty to keep curious visitors occupied. Step into a time machine and see how Moscow’s evolved since the 14th century. Don’t worry about getting bored between matches: from Die Antwood to Anna Karenina, you’ll find something for every mood. Don’t expect a confession from Moscow. Lovers of photography should not miss these exhibitions of Italian photographers in Moscow. Their testimonies of horrific experiences in Iraq and Syria could stop the recruitment of new Russian jihadists. Russia has adopted a policy of blessing freelance murders carried out in its name. Moscow’s most musical film fest begins May 31 and runs through June 10 at several venues around the city. Friday’s vandalism of a beloved painting of Ilya Repin was a shocking incident, but not an isolated case. The Moscow Times art club took a tour of the studio of two brilliant artists, Olga and Leonid Tikhomirov. Deripaska hopes to persuade the U.S. government to rescind sanctions that have crippled his businesses. Sanctions negatively affected the plans of 84 percent of American companies in Russia, the survey said. Expand your borshch vocabulary and repertory with pink or green spring borshch. P.S. Cheat sheet attached. The United States announced sanctions against Russia’s largest aluminum producer, Rusal, on April 6. Gref warned that criminalizing compliance with U.S. sanctions could force international firms to pull out of Russia. Beer and football is a traditional combination for millions football fans all over the world. However, in Moscow, some media are concerned about the lack of beer in the restaurants and bars in the capital of Russia. International Parks Forum in Zaryadye park on June 28. The International Parks Forum, which will bring together the best practices of Moscow, Budapest, London and Amsterdam in the field of landscaping, architecture and eco-urbanism, will take place in Zaryadye park. Russia and Japan have warned they could retaliate against U.S. tariffs on steel and aluminum by imposing sanctions. Who is the unknown actress who won the top award at Cannes this weekend? Andrei Muchnik found out. Thousands of bikers took to the streets of Moscow on May 20, many of them in bizarre costumes. Looking for a great place to eat in Moscow? Here are our top picks — this month. Maybe we’ll change our minds in 30 days. Stay tuned! Relations between Britain and Russia hit a low after London accused Moscow of poisoning former double-agent Sergei Skripal. This Saturday night join the fun of visiting museums long after closing hours for special shows, concerts, theatrical events, or just some picture-gazing. Now that fine weather is really here, what better way to spend the evening than on a charming outdoor terrace with friends? The best way to get into a spring mood is to visit a blooming garden! Here are our top five faves. Andrei Muchnik’s picks of what’s new, what’s interesting, what’s happening this weekend in Moscow. When Victory Day is over, the few remaining veterans of the Great Patriotic War will put away their medals and – do what? The painter Sasha Sokolova shows you their tales of war and their lives today. Beer producers have sent letters to the federal and Moscow governments urging officials not to restrict the sale and consumption of alcohol during the 2018 World Cup. Get ready for Russia’s non-stop celebration of Victory in 1945. The configuration of Russia’s new government is one of the key uncertainties that still hang over the market. If true, the firms violated EU sanctions on Russia over the annexation of Crimea. This year’s Moscow International Film Festival was full of surprises. The absurdist processions called Monstrations that began in Novosibirsk over a decade ago finally made it to Moscow on May Day. 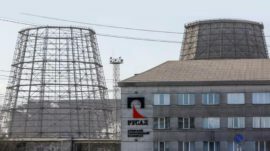 Investors have an additional month to divest or transfer their holdings in sanctions targets United Company Rusal Plc, En+ Group Plc and GAZ Group. Russians celebrate both the coming spring and Labor Day on May 1. On May 1 Gorky Park kicks off its 90th season with its version of LaLaLand. Thousands have amassed in central Moscow to protest against the government’s decision to ban the Telegram messaging service. The sun is shining, the leaves are green, the streets are clean… perfect weather for a run. Major tech firms such as Yandex and VKontakte have voiced their opposition to the Telegram ban. Russia’s Rusal will be forced to quit the global aluminum market and focus on domestic consumers if U.S. sanctions aren’t lifted. Do you experience dacha-envy? Are your dacha-owning friends sick of you sleeping on their porch couch? Do it right this year! Back by popular demand – “From Russia With Laugh -2,” English stand-up comedy night that’s a great way to start the May holidays. French fries at McDonald’s restaurants from Moscow to Murmansk will be Russian from now on. There would not currently be any economic growth in Russia without investment generated by preparations for the 2018 FIFA World Cup. If you’re in Yekaterinburg on business or pleasure, be sure to visit the Yeltsin Presidential Center, which has become one of the city’s most popular sites.